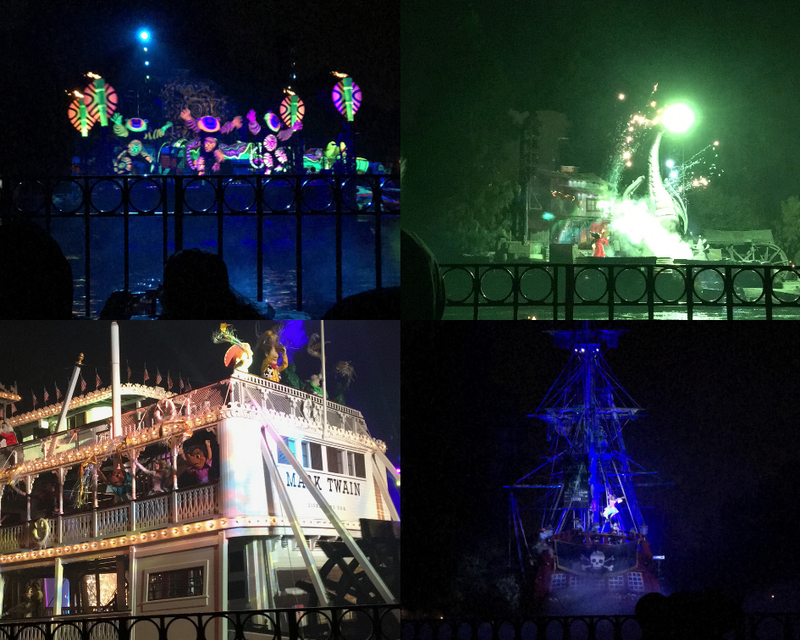 Experience the Disney Magic with the nighttime show Fantasmic! when you choose the Gluten Free On-The-Go dining option at the Hungry Bear Restaurant. 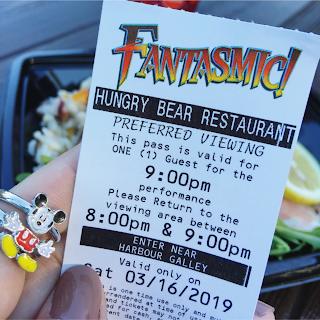 Included with your dining package is a voucher for reserved viewing area at the Fantasmic! show for that evening. 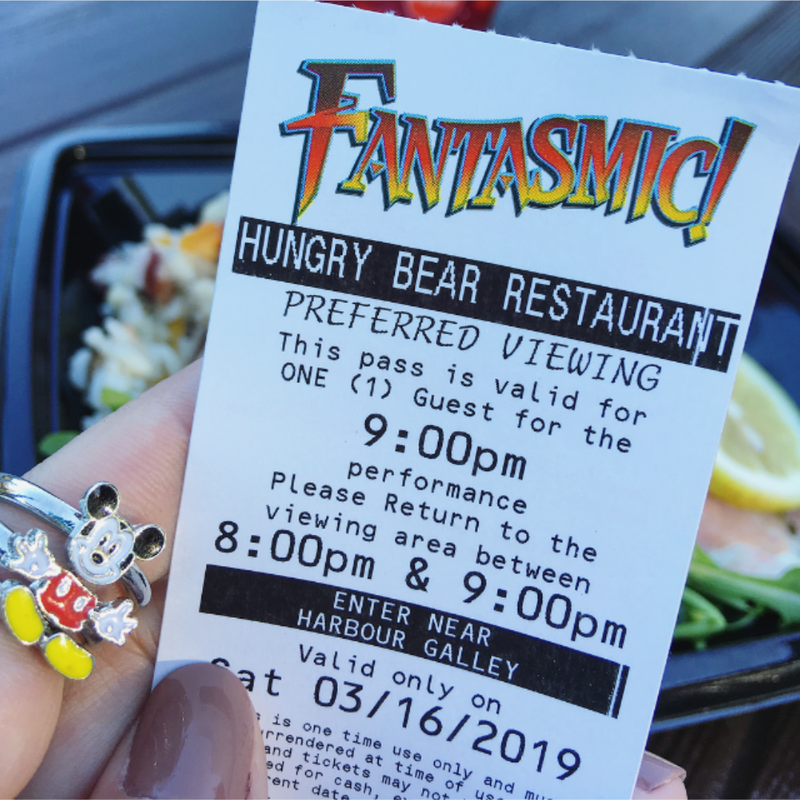 There are several dining packages at Disneyland's Fantasmic! 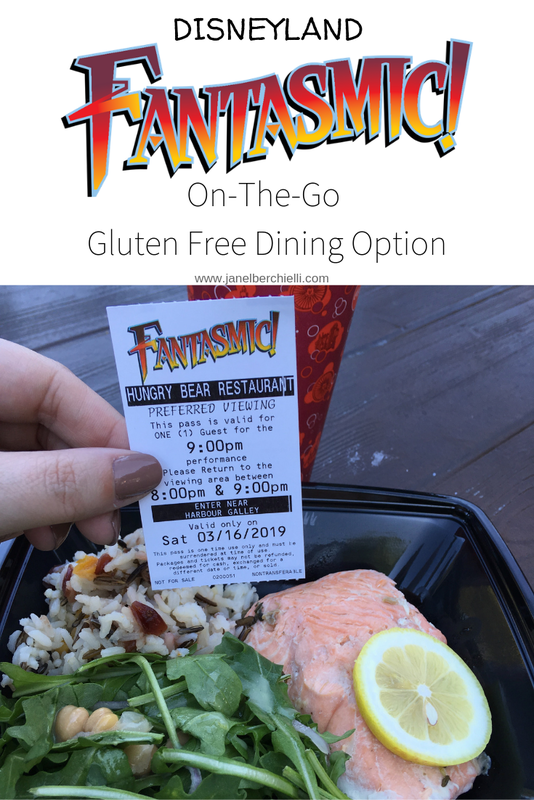 In this article I am going to focus only on the Gluten Free On-The-Go dining option at the Hungry Bear Restaurant. The Fantasmic! On-The-Go Dining Package is available for $29.99 per adult and $19.99 per child (ages 3 to 9); tax is not included. 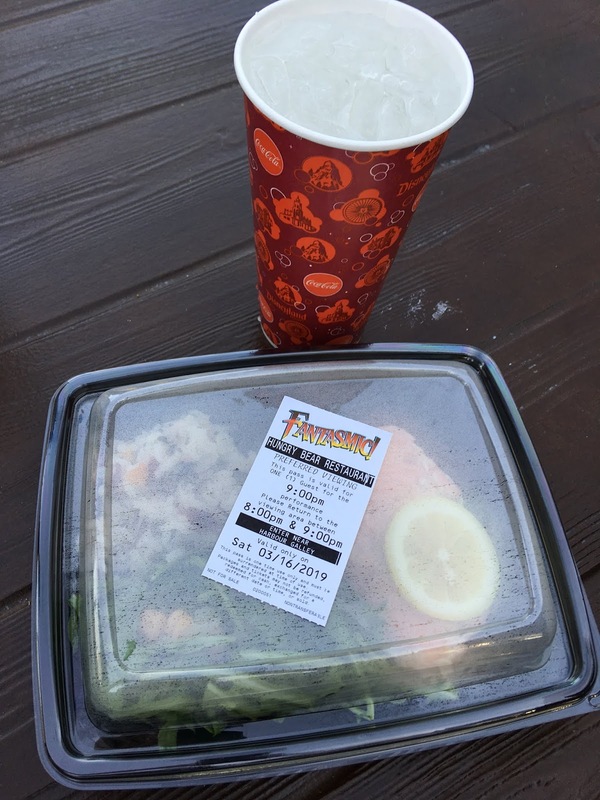 Included with your dining package is a voucher for reserved viewing area at the Fantasmic! show for that evening. This dining option at the Hungry Bear Restaurant is one of the least expensive dining options for the Fantasmic! show. Advance reservations are recommended but not required. You will choose one of 4 delicious entrees from a menu created especially for this event—cedar salt-roasted sustainable salmon, barbecue chicken, blackberry barbecue pork riblets or an amazing mushroom and leek frittata. 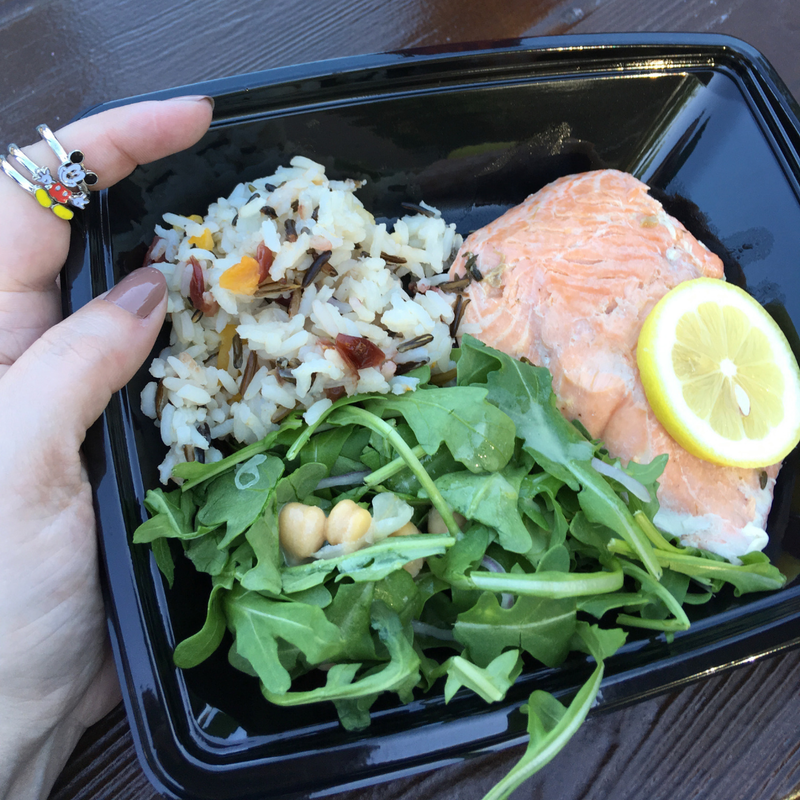 All dishes are served with a medley of wild rice and cranberry-apricot grains as well as kale and garbanzo bean salad and your choice of beverage. If you are gluten free the chef will consult with you and you can choose from one of the entree options which I was told are all gluten free or they will substitute with something from the regular menu. 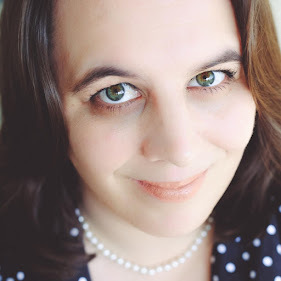 I did not have the chance to reserve this dining experience in advance, so I took my chance and was pleasantly surprised there was several reservations available even on an extremely busy Saturday at 5pm. I verified that all the dishes were gluten free and made sure the cast member put the notation in with my order. I waited less than 5 minutes for my order to be ready. You are welcome to find a seat and eat at the Hungry Bear or take it to go. I decided to eat my meal at the Hungry Bear. In the back of the restaurant is pliantly of quiet seating with views of Rivers of America, the train as it passes by and you can see some of the Star Wars Galaxy's Edge area. 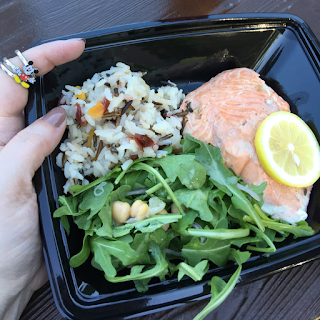 I ordered the cedar salt-roasted sustainable salmon with the wild rice and salad. The salmon was absolutely scrumptious, full of flavor in every bite. I loved the rice as well, but wasn't a huge fan of the salad. The meal left me full and satisfied. 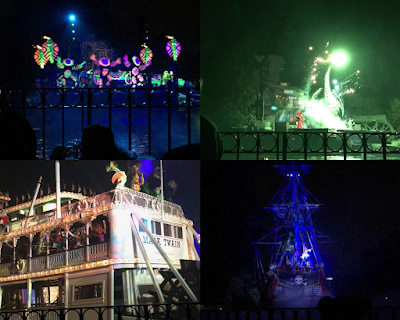 Typically there are 2 evening shows of Fantasmic! and which one you get a reserved viewing area voucher for depends on what time you select to get your meal. The viewing area is separate from the dining area. 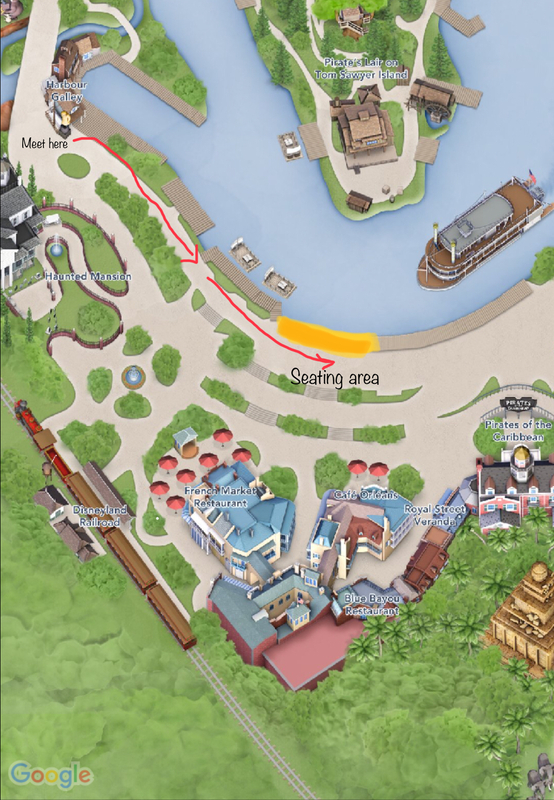 Reservations made for 3:00 PM through 6:45 PM will receive a voucher that permits entry into the reserved viewing area for the first performance of Fantasmic! that evening; reservations from 7:00 PM to 8:30 PM will receive a voucher permitting entry into the reserved viewing area for that night's second show. Since I had an early meal I received a voucher for the first show. After my meal I had about 3 hours to visit some attractions before the show began. 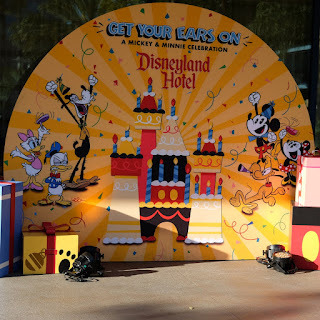 It was such a crowded day I made sure I came back 45 minutes before the show to the check in area just past the Haunted Mansion by Harbor Galley. You will be instructed to wait there until a cast member takes a group to the viewing areas. There are separate viewing areas depending on the different dining packages offered. The Hungry Bear dining packages viewing area is in front but slightly off to the left side facing the Rivers of America (see above photo the yellow area is the seating area). This is an area where every guest is required to remain seated on the ground during the show which is a great way to rest your tired feet. One cast member gave me a tip to sit further back to not have the fence blocking you. This area is slightly slanted making it easier for great viewing. Since I arrived early I was the 3rd row back and while the fence was there it did not hinder my view at all. Fantasmic! show is spectacular! And this viewing area made my experience even more magical! I definitely appreciated no one was blocking my view and no children were on shoulders (my pet peeve it ruins the show for others when you put a child on your shoulders) and there were also NOT a sea of cellphone screens above heads either. The show is approximately 30 minutes long. My favorite part of the is about 3/4 of the way through when Mickey fights the Dragon. The visual effects of the dragon and her fire are so close you can feel the warmth! If the weather is cooperating a firework show generally is right after the 1st show of Fantasmic! Insider tip given to me was to stay in the same area to view the show. For some reason most people don't realize this and they get up and leave. Move up as close to the railing as you can to have the best unobstructed view for the fireworks show. 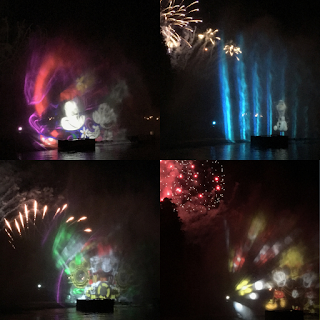 When I went the show was Mickey's Mix Magic and the projections and fireworks are right there at the Rivers of America. Rock your world at Mickey’s Mix Magic, an all-new nightly extravaganza bursting with magical song tracks, kaleidoscopic projections and exciting lights and lasers guaranteed to electrify your soul! The scene is set as state-of-the-art projections, lighting and lasers turn Main Street, U.S.A., the water screens on Rivers of America and the façade of “it’s a small world” into dazzling displays of sight, sound and color. The Fireworks show was 10 minutes long and afterward the area was pretty empty. In my opinion it is the best spot in the house the view the entire show of fireworks! I personally feel like the On-The-Go dining option for Fantasmic! 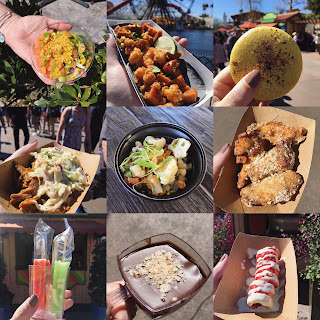 is the best bang for your budget giving you an amazing viewing area and the dining option can be accommodated easily for gluten free or other dietary restriction needs. I would highly suggest everyone experience this dining option at least once. 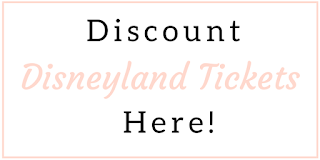 You really get the VIP experience and that extra bit of Disney Magic!